Was your Dog, Cat or Pet naughty? Did they have an accident on your carpets? 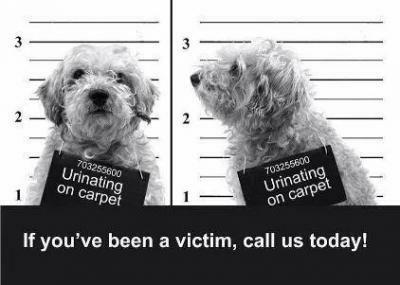 Do you need help with pet stain and urinating odor removal from your carpets in Birmingham, AL? If so, we understand! And, we know how you feel. We have pets and they are one of the reasons we started our Heaven’s Best Carpet Cleaning Company here in Birmingham, Alabama. We got our first precious little puppy a couple years before we went into the carpet cleaning business. We learned very soon that even though we were doing everything possible to train him to go outside, he still had accidents. It seems like we were cleaning up urine spots just about every day or two. It was getting really irritating. Although, we love “Lil’ Bolt,” we considered getting rid of him or sending him to Doggie jail for his mistakes. But, we couldn’t do it. We love him too much! So, we went to work learning as much as we could about getting dog and cat urine stains and odors out of our carpet. While we were learning about this, we decided to open up our Heaven’s Best Carpet & Upholstery Cleaning business here in the Birmingham, AL metro area. We realized there were many others struggling with this same problem and we want to help. We know how much we love our pets and just about everyone we know owns pets and loves them just as much as we do. We realized that we are not the only one with this problem. Many or our friends, neighbors and now customers have the same problem. Well, we are here to help! After much trial and error with about every product on the market, we have found the best cleaning products to clean up pet urine stains and to get rid of the odor. We took it even a step further and got IICRC-certified (Institute of Inspection, Cleaning and Restoration Certification) so we could learn everything there is to know about cleaning carpets and all sorts of stains. Our firm is now an IICRC-certified Firm. This means we have been trained and tested on the latest technology for cleaning carpets and upholstery. We bring all our experience and knowledge with us to clean your home, along with the best cleaning products and state-of-the-art equipment. So, if you are struggling with Pet Stains and Urinating Odor Removal in Birmingham, AL, and need help, call Heaven’s Best Carpet & Upholstery Cleaning today at (205) 618-9150. Our rates are very reasonable and much less than the other carpet cleaners in Birmingham. We will also come out and give you a FREE ESTIMATE. Don’t let Pet Stains and Odors ruin your home, call Heaven’s Best today at (205) 618-9150.